Trollstigen National Tourist Route Project, Trollstigen - Møre and Romsdal, Norway, 2005-2012. 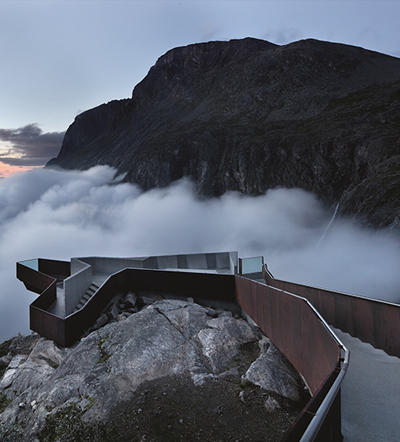 By Reiulf Ramstad Architects. We tend to travel in one of two ways: to a city to dive into its rhythms and culture, or to some out-of-the-way place to abandon ourselves to the landscape. It’s this second kind of adventure that’s the focus of Once in a Lifetime: Travel and Leisure Redefined. The book showcases new international lodges, campsites, retreats and lookouts that lure guests to a quiet, secluded place. Instead of high thread count sheets and Michelin-star restaurants, what these places offer is private, uninterrupted access to a special landscape. So it’s regions with extreme, picturesque geographies, especially those in less-traveled corners of the globe, that offer some of the finest destinations. The book takes us to the backwaters of Cambodia, forests in the Alps, and the deserts of Namibia and Tanzania. These lodges and the amenities they offer are modest compared to typical full-service resorts. Instead they break down the routines of sleeping, bathing and dining into clarifying essentials, pursuing sensuality over opulence. The architecture of these retreats sits restfully within the surroundings and opens itself radically to the outside. Sometimes the experience stimulates, like the otherworldly forest views that pour through wraparound picture windows at the Juvet Landscape Hotel in Norway.